The Wisconsin Historical Society reports that all the stained glass was removed except the transom over the main entrance. They further report the original Kimball pipe organ is sill there. 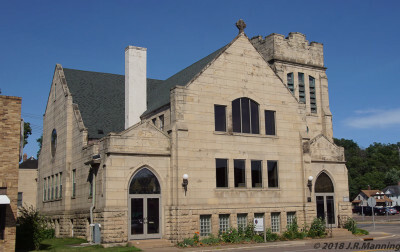 "Designed by the firm of Alban and Fisher from St. Paul, Minnesota, this building is one of five Neo-Gothic Revival buildings constructed in Eau Claire between 1911 and 1920. The church was originally built for the First Methodist Episcopal Church which occupied the building until 1930, when the congregation combined with the Lake Street Methodist church located on the City’s west side. Immanuel Lutheran Church then utilized the building until 1980, at which time they built a new church. The Unitarian Universalist Fellowship then purchased the building and has since held services in the church. "The Neo-Gothic Revival style influences of the building include the Gothic arch transoms above the windows, the steeply pitched roofs and buttresses, pinnacles and battlements. The original Kimball and Company pipe organ, which was manufactured in Chicago at a cost of $3,000, is still in the church." Wisconsin Historical Society - Fist Methodist Episcopal Church page of the WHS site.